Gamepad w/ Autofire for Amiga, Commodore 64, Atari, etc. 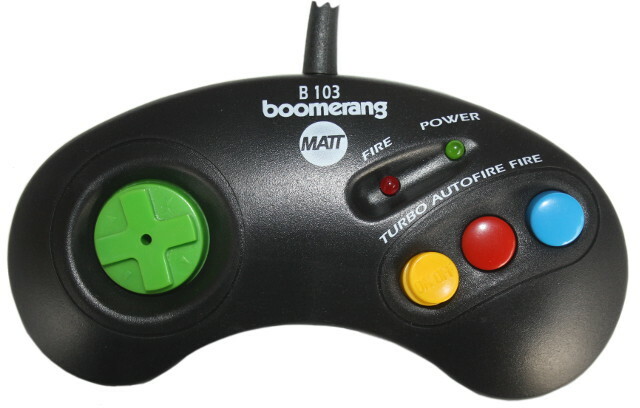 The Boomerang B103P gamepad can be used with any computer/console that features an Atari-compatible 9-pin joystick port (Amiga, C64, MSX, etc.). The gamepad comes with one standard fire button, another button for autofire, and a lockable turbo autofire button. There are two LEDs indicating function and fire activity. There are two add-ons included with the B103P, a joystick and a spherical dome that can be mounted on the directional control. Please note: The colours of the controls may vary.